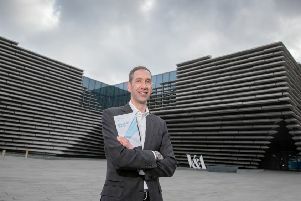 FEW Scottish firms have such a strong – and literal – claim to being one of the brightest leading lights on the technology scene as pureLiFi. capability in its iOS 9.0. According to pureLiFi, the “5G technology” of light-based communication is not only more energy efficient than WiFi; it’s also more secure, thanks to the simple fact that a LiFi receiver has to be in the same room as the transmitter. It’s this simplicity that also has some experts tipping LiFi to be the technology that will really open up the so-called “Internet of Things”, allowing household appliances to communicate with the internet, mobile phones and each other, for example. This February, pureLiFi co-founder Prof. Harald Haas launched the Edinburgh firm’s newest product, LiFi-X, at the Mobile World Congress 2016 in Barcelona. The LiFi-X consists of an access point that connects to any LED light, as well as a business-card-size dongle that can be operated from a mobile device. A key step in pureLiFi’s journey was its involvement in the Engage Invest Exploit (EIE) investor showcase event in Edinburgh, which sees start-ups pitch their businesses to investors. The event, organised by Informatics Ventures, offers burgeoning Scottish businesses a great platform to network with industry leaders, experts and potential investors – and companies such as pureLiFi have reaped the benefits of EIE. Thanks to initiatives such as EIE, combined with the hard work and innovative thinking behind pureLiFi, LED-based communications technology could soon see the light of day. You can register your interest in EIE17 on their website.